So my Dad got a new job… in Belfast, Northern Ireland. He moved there, and has been flying back and forth to keep seeing us, until everything is sorted our end too; my Mum and sister will shortly follow with the dog, but I’m staying put in England in a place of my own. I have adapted fairly well (even if I have been without internet for the best part of a month – hence the lack of posts); and I’m sure my family will adapt too, and eventually the dog. The first thing we thought of for the dog, for Barney, was the travel. He hates travel. Even 5 minutes down the road to the park or the vet, he cries and gets foul odoured stress-breath! He can’t be sedated for the flight or the ferry in case anything happens, he needs to be awake and able to get himself out of any trouble. So, the decision was made to keep him with the family to travel – so that’s the long (8 hour) ferry. He needs a kennel booking but the family can go be with him, and it’s overnight so we hope he’ll just sleep. However to make the transition easier, we have opted to try the Adaptil* dog collar; to relieve at least some of the stress he will experience through this long journey. 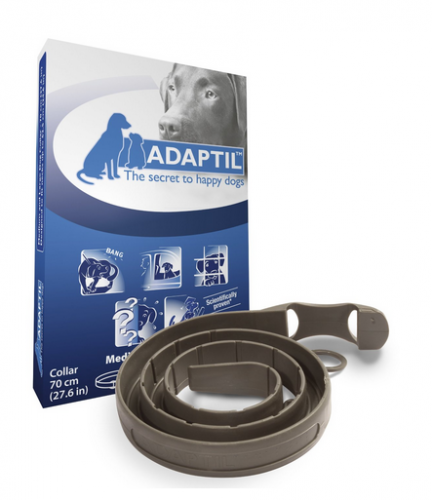 The Adaptil dog collar is much like the plug-in diffuser, in the sense it releases the same calming pheromone as the plug-in – just in a different way. 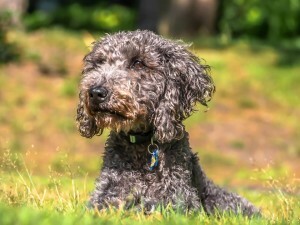 As I said in my post about dogs and fireworks (http://alisanswers.com/index.php/2014/10/23/common-behavioural-problems-fireworks-anxiety-dogs/); the collar works with the heat of the animal; activated by the heat it releases the pheromone into the blood stream. The collar will last approximately 4 weeks, and keep working – which will also help him settle into the new house and surroundings; and should help with his preference of being the only dog, and help him to adapt to the new neighbour (Golden Retriever). Once the collar is taken off, it stops working – if taken off before the 4 weeks is up, you can keep hold of it as it’ll work again later. It can be ordered through your vet, bought in/ ordered through a pet store, or via the internet – I bought Barney’s from Amazon. So let’s see how well he copes – putting Adaptil to the test, helping Barney to adapt! NB. Adaptil is for dogs only. *Adaptil comes in the forms of collar, diffuser, and spray. Feliway is the cat version; coming in the forms of collar and diffuser.